I’ve been reading a book about travel writing and one thing that the author stresses that is important for travel writers is to be open to the unexpected and be willing to investigate. I felt this advice boded well for me when, thinking I would write some cute piece on “romantic Paris,” I tried to go to the Musee de la Vie Romantique, but it was closed during the installation of their new exhibition. However, I found something even better on the Rue Chaptal, near the museum. There was a small impasse coming off the street and I noticed the sign said “Bibliotheque.” Noting there was a garden, I decided to go in, because I love the gardens and courtyards in Paris hidden behind outer, street facing walls. I was not disappointed in the least. This, comfortable, renovated library with futuristic looking chairs, computers and newspapers available for browsing is snugly located in an 18th century hotel particular. They’ve kept the details like the fireplace, frescoed ceiling and moldings intact, and reading Le Monde in such a salon-like setting felt like a truly unique Paris experiences. 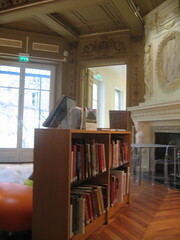 This entry was posted in Reading, Travel and tagged bibliotheque, chaptal, France, library, Paris, Travel. Bookmark the permalink.